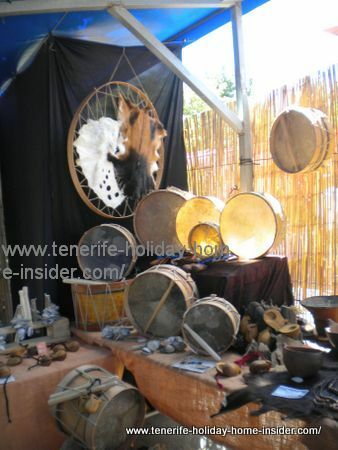 Pinolere the Tenerife and Canary Islands yearly craft fair. 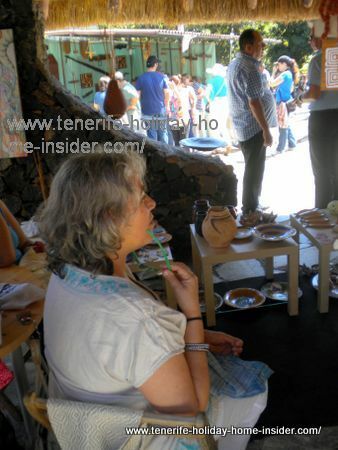 Much more than Pinolere craft shopping at its fair. 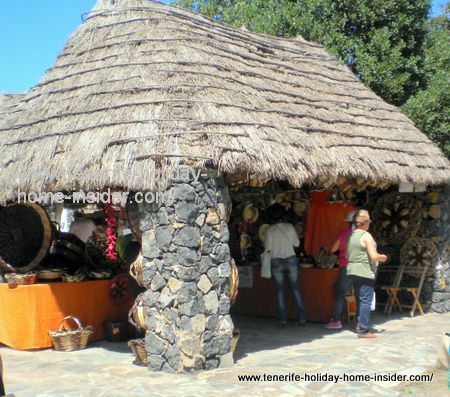 The Pinolere crafts market with workshops of three days takes place at the end of summer. 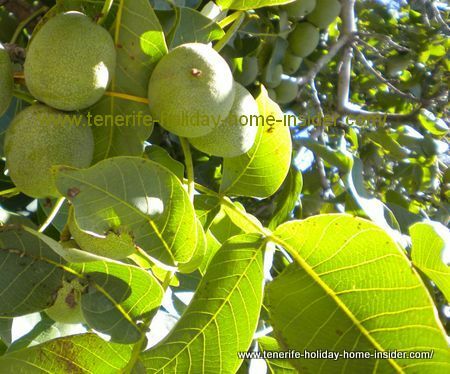 It's an important national fair of the Canary Islands. 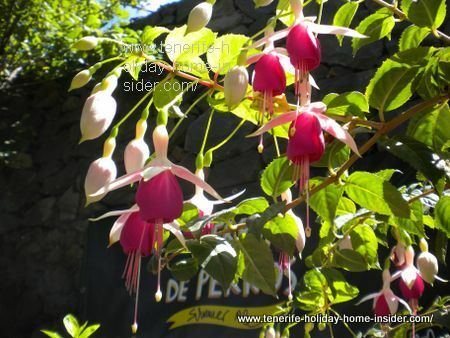 It is located in most unusual, multi level surroundings in a spacious i>ethnographic park( Tel: 0034 + 922 336733 and 922 222678). .
Its countryside halfway up from the famous Corona Forestal and the Caldera of Aguamansa is more than often a lush green jewel under blue skies. thatched stone house without windows, some of which open on two sides. 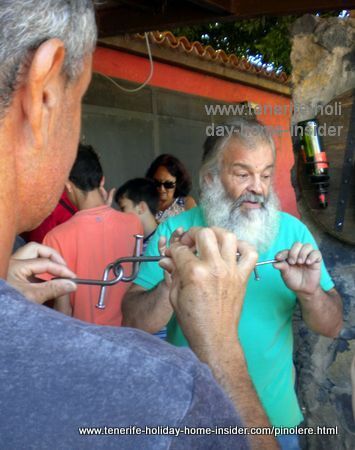 An open workshop for iron forging and metal art by a blacksmith from Icod de los Vinos in a threshing circle between traditional rural structures. 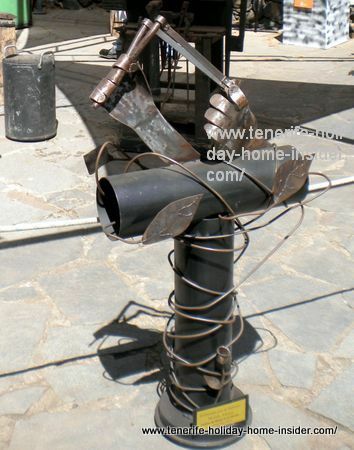 Click photo for the article of the Afonso metal art of a Cabeza de Gallo flower for a Tenerife town. Photo courtesy of its Town Hall. 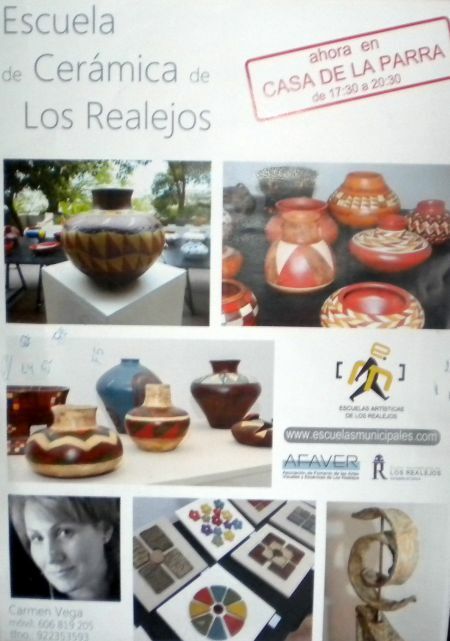 An offline workshop where mostly kids seem to have great fun making pottery at Realejo Bajo with Tel: 922 353593 to confirm the time. 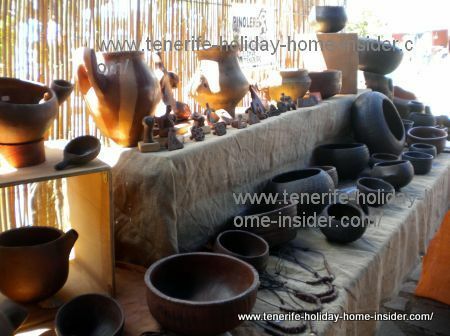 Traditional pottery at craft fair. 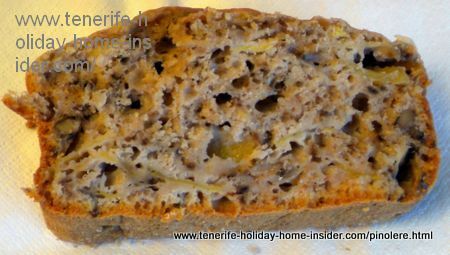 A delicious slice of sugar free almond cake made with Stevia which i couldn't resist to taste. 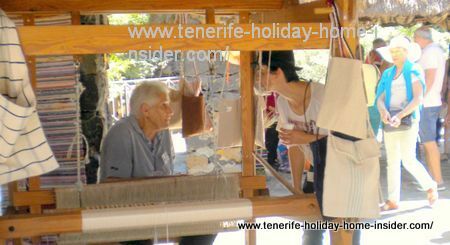 Manual weaving loom with woven textiles for sale. Tacoa surf beers for surfers made in Tenerife. Tacoa stall at the Ortoava fair. 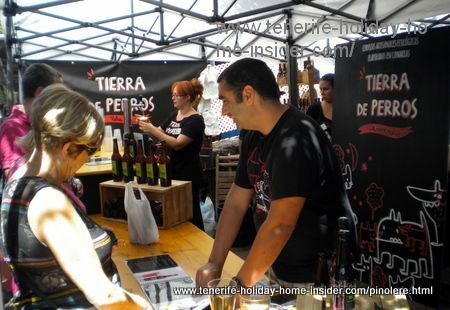 Vegan beer stall for Ales of different size and price at the rural Orotava craft fair. 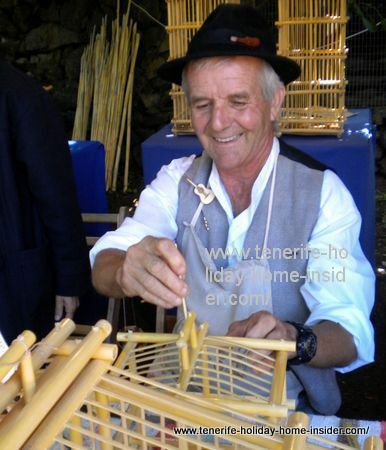 from Gran Canaria who is showing how they are done with Cane. 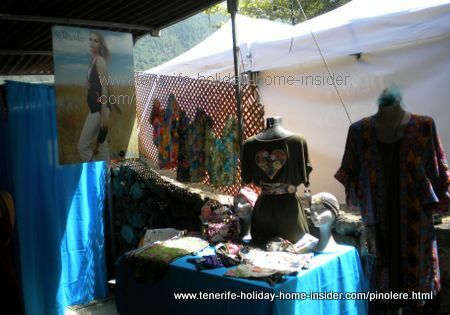 Wares made by "A Manita Modista" the Santa Cruz Tenerife fashion desiger for made to measure garments. 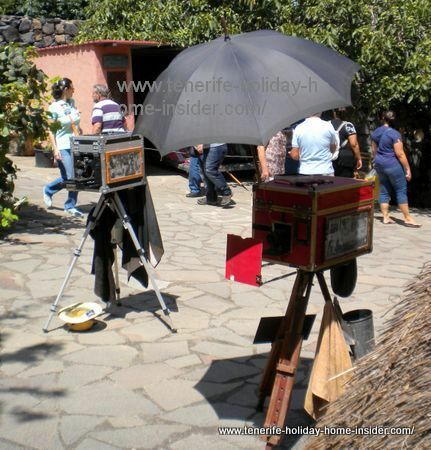 19th century cameras displayed by the rural Orotava ethnographic museum. 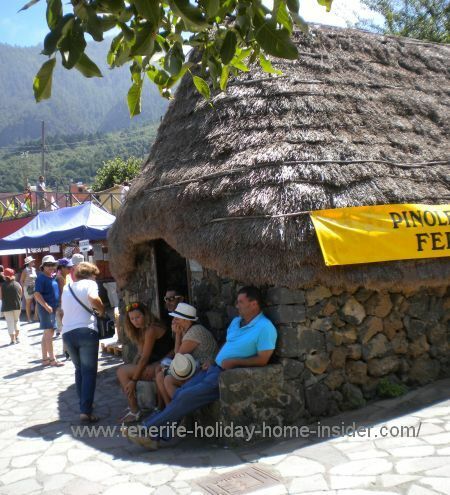 How get to Pinolere of La Orotava? I ignored the shuttle bus. 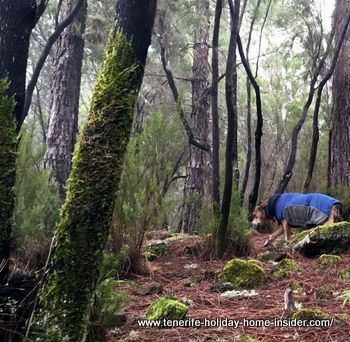 Instead, I walked for more than half an hour uphill from the 345 Tista bus stop (catch it in Puerto Cruz or Orotava) The road leaves little space for pedestrians and utmost care must be taken with traffic in two directions. By the cars, a ruin of an ethnograpic structure without the thatch roof but bare, jumbled up twigs. 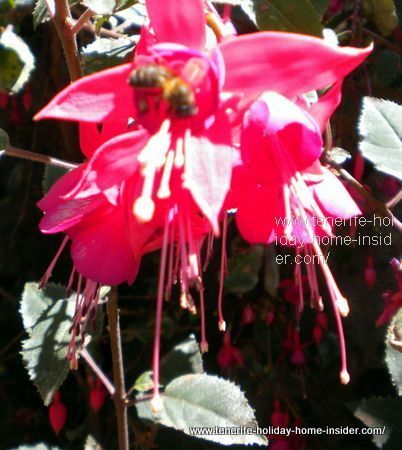 Not done by Guanche natives, by the way. Mostly locals bought cheese, bread and pastries. Some men purchased novelty beers, while some tourists went for crafts. 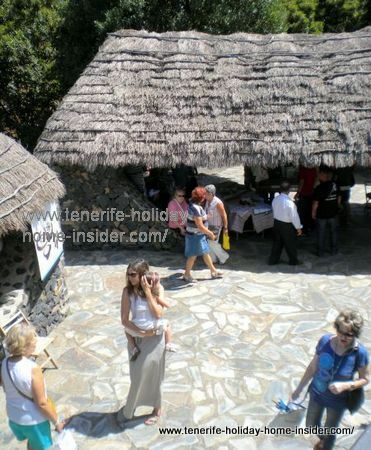 However, the exhibitors need to sell so much more. 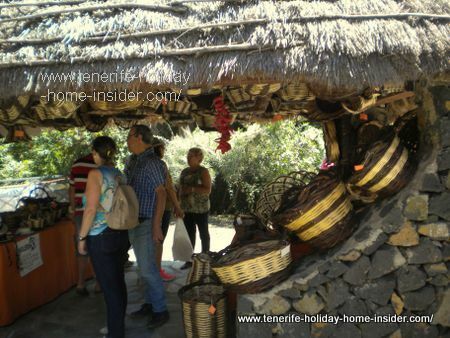 The fair is highly interesting, but most seem to see it above all as a large exhibition center for Canary Island traditional crafts and novelties. 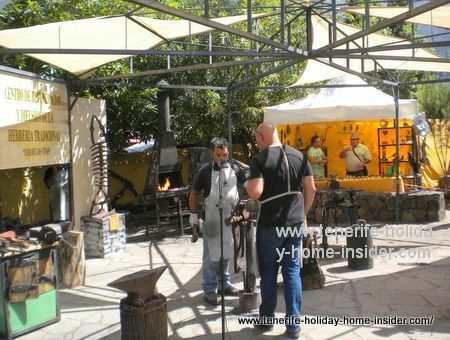 It certainly is a fantastic location for a family outing with fun for any age. 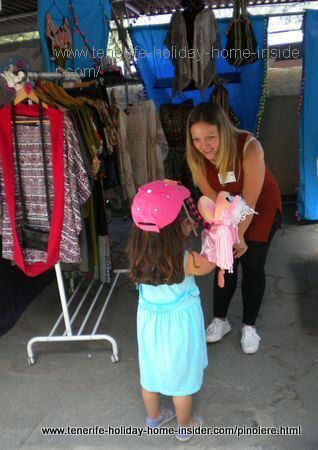 Lets hope that the expected 30000 visitors and the sunny period of the 2015 event made a difference with the expenses of the 3 day fair.